This last week has been all about the annual celebrations in Certaldo called the Mercantia, when the usually quiet relaxed town goes a little crazy having a sort of carnival for five days. The festivities start around six in the evening and stands selling everything imaginable line the streets and Piazzas. Certaldo Alto is the most popular, especially with tourists, as there are parades of locals in the most amazing costumes and performing artists. The downside is that it is impossible to park close by and people have to trudge at least half a mile into the centre. However, the locals seem to automatically go with the flow. Even our favourite coffee bar, Il Solferino, had a covered area outside selling ice-cream, filled Panini and wine, of course. 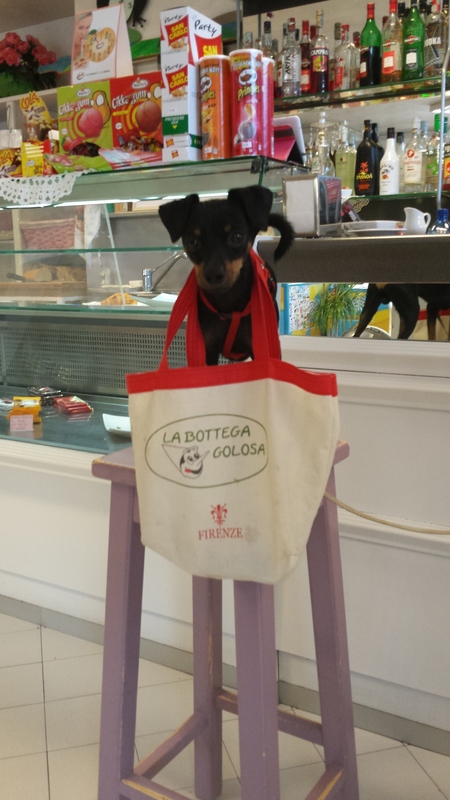 Shopping Dog in Laura’s Bar/Alimentare. So, apart from the heat, the main subject at Laura’s Bar/alimentare has been the Mercantia. “Have you been” or “Are you going?” or “Did you see that amazing….” all in Italian of course. Meanwhile life carrys on as normal for we country folk and the villagers in Fiano. Spotted earlier in the week was a little dog out shopping at Laura’s and lots of short skirts (it doesn’t matter if you are over eighty here). But the weather has been torturous. The heat only relents a little after seven in the evening, so that’s when we go outside, covered in mosquito protection, to enjoy an aperitivo. The poor tourists, many of whom stay in self-catering villas, have discovered that many do not have air-conditioning or mosquito curtains and it is very important to be able to throw the windows open overnight to let the cooler air in. So, be warned, bring mosquito protection, check if your villa is air-conditioned or at least has fans and mosquito curtains! 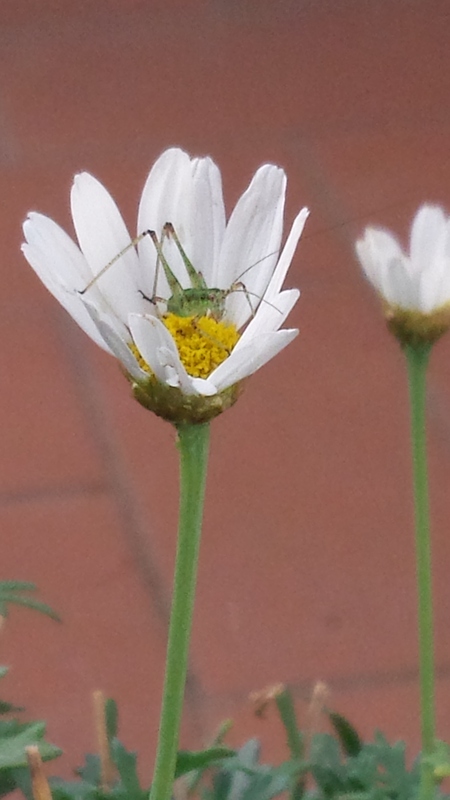 Grasshopper type insect in Daisy. Large jumping insect on ceramic pot. On a happier note, the garden has been attracting some fascinating insects. If anyone can name them we would be very keen to hear from you. 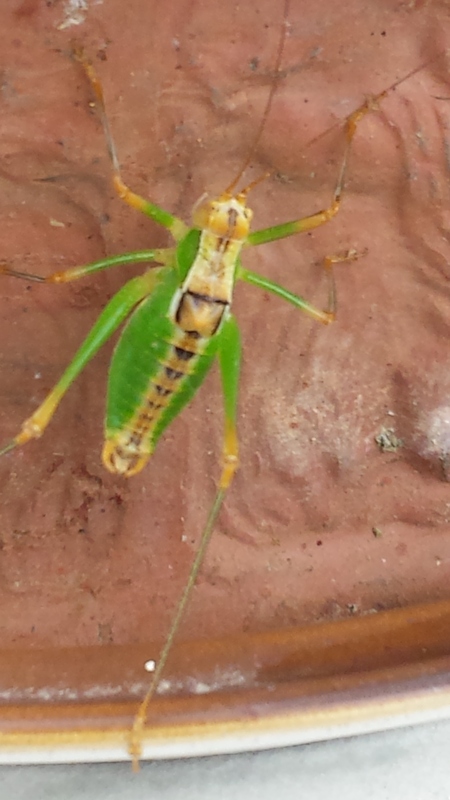 Probably members of some grasshopping/cricket type family? Also difficult to photograph are the articulated bees and gorgeous humming-bird type bees, however, we’ll try to get a picture or two for you. Well, it is Sunday Morning, another very hot day,however, I must put a couple of hours writing in and complete another chapter of ‘The Italian Connection’. I have pasted a snippet below to give you a taste. So, may I wish you all a great week and if you are outside of Tuscany, hopefully you will enjoy cooler weather! We’ll catch up with Silvio Berlusconi next week! I turned slowly and looked up into the chocolate-brown eyes of Laurent DuPont. “Was that you jogging through the garden earlier?” I smiled, acting as if we were meeting for the first time. We shook hands. “Oui, you were watching me then, or more likely my tight bottom and rippling muscles.” I nodded. “Yes, I am English and you are French I think?” I said rather more loudly as Roberto approached from behind Laurent. “Ah, bene, you have found someone to talk to.” He smiled. “Yes, this very nice Frenchman, what did you say your name was?” I looked wide-eyed at Laurent. “Jean-Paul Gautier, at your service.” He took my hand and lifted it to his lips. PS Don’t forget to visit my author site http://www.amazon.com/author/junefinnigan or join me on Twitter, Goodreads or Facebook.